The house-made corn tortillas make the tacos at this Beacon Hill spot just great, and chef Monica Dimas swears by the soup. The enormous mortar and pestle full of freshly made salsa on the counter might be your first clue that Carnitas Michoacan on Beacon Hill is your new favorite taqueria. Then there’s the carniceria in the back, with all kinds of meat lined up in the case, yards and yards of it; the al pastor practically glows, the pork a rich, deep red from chilies and achiote, with sunny slices of pineapple on top. In between, it’s a dozen or so tables under two flatscreens showing football (not the American kind) and fluorescent lights. The tacos: Those cushiony, super-fresh corn tortillas make a superb conveyance for meat to mouth, like carne asada, garlicky and grill-charred just right; lengua, mild and melty-soft; carnitas, tender with rendered fat (though beware of bones); pollo, nicely spiced, if a bit dry on our visit. Get more toppings from the salsa bar, though arguably, a squeeze of lime is all these beauties need. And with taco prices creeping to $3 each and higher in other neighborhoods, the price is nice: $2.09 each (tripe or lengua, $2.79). 2503 Beacon Ave. S., Seattle; 206-323-3688; on Facebook; 11 a.m.-9 p.m. daily. More from the menu: A carne asada platter here has more thin-sliced, tender, tasty meat than one person should probably eat. One small bowl of caldo des res contained big hunks of falling-apart beef, a large carrot, a whole potato, a section of corn on the cob and the kind of just-salty-and-greasy-enough broth that could vanquish any hangover (chef Monica Dimas of Neon Taco, Tortas Condesa and Sunset Fried Chicken Sandwiches swears by it). The corn tortillas help quesadillas achieve excellence, for once: thick but pliant, not too cheesy, served with limey, oniony, chunky guacamole. Get the guacamole. Make it at home: Some chorizo, carne asada and more would be great to grill, and Carnitas Michoacan sells their corn tortillas to go. Taco night! 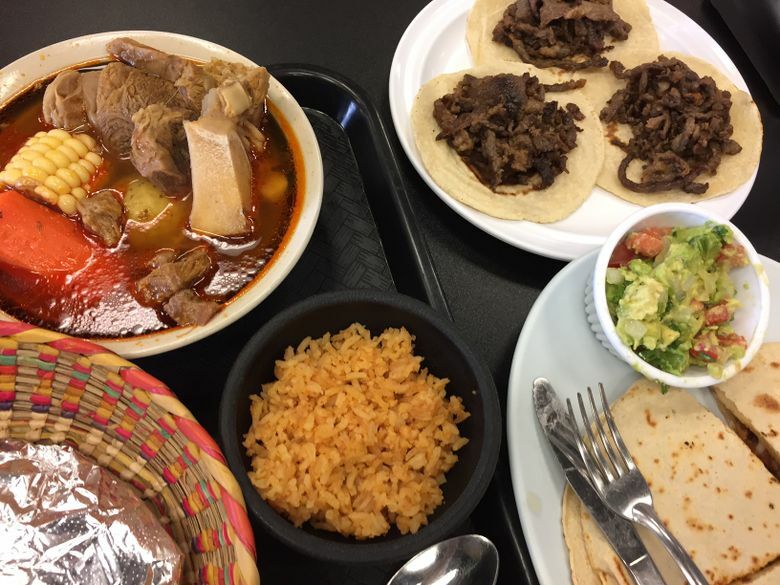 Nice prices: A taco plate — three tacos, rice and beans — is $8.99; carne asada platter, $12.99; caldo de res, $9.99 small/$10.99 large; quesadilla with guacamole, $8.99; side of guacamole, $2.29; tacos, $2.09 each (tripe or lengua, $2.79); beer, $2.99 domestic/$3.49 imported. If you can eat more than $10 or $15 worth of food at Carnitas Michoacan, you are a hero of appetite.